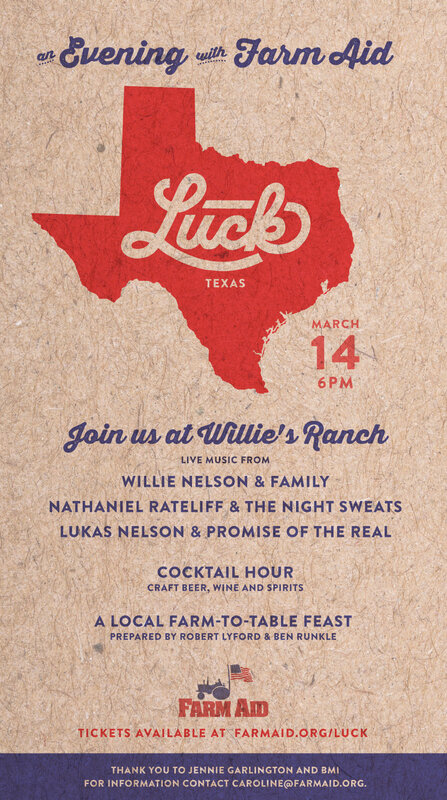 The evening kicks off with cocktails and a locally-sourced, farm-to-table dinner prepared by Texas chefs Robert Lyford and Ben Runkle before lively sets from Willie Nelson & Family, Nathaniel Rateliff & The Night Sweats and Lukas Nelson & Promise of the Real. This entry was posted on Wednesday, March 14th, 2018 at 9:42 am and is filed under Farm Aid, Luck Reunion. You can follow any responses to this entry through the RSS 2.0 feed. You can leave a response, or trackback from your own site.